New York City, NY – Nike is one of those brands that has been able to withstand the test of time. This summer they sponsored the 2nd Annual NY vs NY basketball tournament which featured some of the best High School Basketball talent in the New York metro area. This tournament is a genius idea as each week the venue changes as staff travels to different Streetball venues around the city. The NY vs NY family consist of a few major tournaments in New York City, Dyckman Park (Washington Heights), West 4th (East Village Manhattan), Watson (Bronx)Lincoln Park (Queens), Tristate (Harlem) and Gersh Park (Brooklyn). The mission of the tournament was to unite NYC at the grassroots basketball level and uplift communities in the city at the same time. When you think about the New York City Basketball you think about the city being the Mecca of Streetball. I can’t help but remember hearing stories of the greats who gave their blood, sweat and tears to the courts of New York City. Guys like Kenny Anderson, Rod Strickland, Kareem Abdul Jabbar, Chris Mullin, Stephon Marbury come to mind immediately. Me being an avid Streetball fan, I dig deeper into the history of the city and think of guys like God Shammgod, the late Black Widow, the late John Strickland (Franchise), Master Rob, Rafer Alston, The Future Malloy and a gang of other ballers who paved the way for any ballers who plays Streetball today. Nike Basketball and Game 7 put a lot of planning and resources into this tournament of champions. NBA players like Ben Simmons, Quinn Cook, Lamar Odom and Kyrie Irving sat in on a few of the games this year enhancing the tournament that much more. Entertainers also were in attendance as well. The best players in the city are spread out around the boroughs playing at different tournaments. These tournaments all feel as though they have the best tournament in the city. The NY vs NY platform gives each of these major tournaments the opportunity to show and prove who has the best talent in the city. Although bragging rights are at stake there is a healthy competition between these venues and winning the championship is everyone’s goal. Gersh Park was last years Champions and they looked to repeat this year. Led by this years MVP Jaquan Carlos, Gersh looked strong every single week going undefeated. Coach of the year Gary Ervin prepared his team every week for battle and they were able to fight until the buzzer sounded. 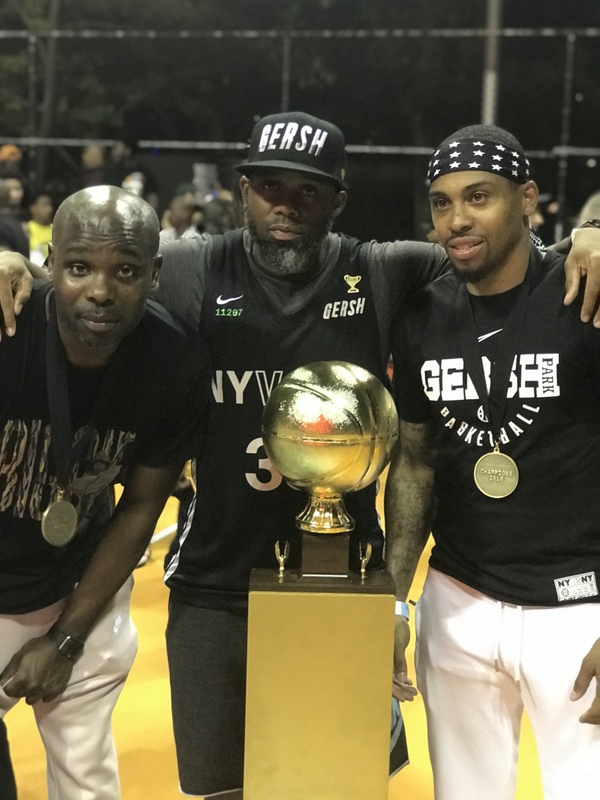 History would repeat itself as Gersh and Dyckman faced off in the championship for the second time back to back. This time the championship game would be held at none other than the Mecca of Streetball, Rucker Park in Harlem. This court is hallowed ground and has a lot of history attached to it. Guys like Dr. J, Kareem Abdul Jabbar, Carlos, only a sophomore at Thomas Jefferson High School in Brooklyn shined all tournament long. He was able to do whatever he wanted and even took on the challenge of going head to head in the championship against the #3 player in all of America, Cole Anthony. Carlos took the challenge and went to work controlling the pace of the game and scoring at will. The Championship, between Gersh and Dyckman, was announced by the premier basketball emcee David “Cha-Ching” Teele, who was rocking the costume that started his run, Dr. Cha Ching. At the end it was Gersh Park who hoisted up the golden trophy. They simply were too much for anybody to handle and they had a gang of loyal fans who made the trip with them to every venue. Salute to DP, Fly Ty and the rest of the Gersh staff. You did it again! But the question is now is “Will they 3-peat. Cal Griffin is a contributing writer for PureSportsNY.com. A graduate of Hampton University, Cal has always had a passion for sports and for writing. Combining his two passions has been a no-brainer for him as he aims to provide insightful and thought provoking articles that will give sports fans a glimpse into his world.